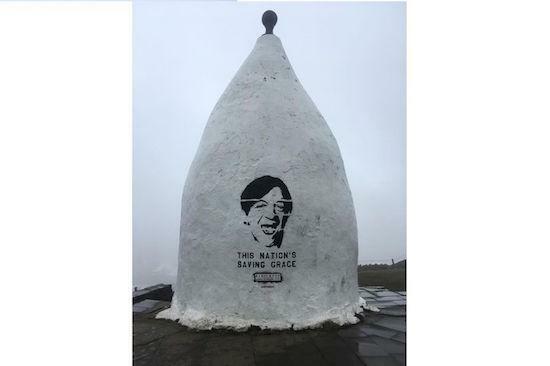 Residents in Macclesfield have complained after the face of the late Mark E Smith was painted onto a local monument, White Nancy. The monument, which can be found at the top of Kerridge Hill, has had the face of The Fall's frontman, who passed away last month, painted onto it above the words "This nation's saving grace". As The Macclesfield Express reports, a Facebook group has since claimed responsibility for the addition to the monument and has said that it will return to restore White Nancy to its original condition. However, Bollington Council, which oversees the area, claims that a special kind of masonry paint is required to do so. In the past, the council has approved additions to the monument however with the Olympic rings and the Jubilee Crown both appearing on it, but the unapproved tribute will soon be painted over following complaints from locals. "It has had a face painted on it and some message has also been written on it," town clerk David Naylor told The Macclesfield Express. "We have painted on it in the past for certain causes like breast cancer awareness, which is great, but this has no place on White Nancy." Karen Smith, one of the co-owners of the monument, added: "I think it's absolutely awful... especially on something as special and beautiful as White Nancy. I would have painted over it myself ASAP had it not already been done. Please no more graffiti on her."